Three-legged orange sea spider equipment platforms, bright yellow bulbous floats, anchors, line, and a variety of oceanographic instruments fill the rear deck of Scripps Oceanography research vessel Sally Ride in this photo taken by technician Drew Cole. Sally Ride departed Thursday to participate in the Inner Shelf Dynamics main experiment during which researchers from a number of institutions will deploy equipment for two months to extensively study the Pacific coast's "inner shelf," the portion of the continental shelf that extends from just outside the surf zone to where the water reaches a depth of about 50 meters (164 feet). The main goal of the Office of Naval Research-supported project is to improve understanding and prediction of this environment. "This will involve efforts to assess the influence of the different boundaries — surf zone, mid and outer shelf, air-water interface, and bed — on the flow, mixing and stratification of the inner shelf. We will also gain information and predictive understanding of remotely sensed surface processes and their connection to processes in the underlying water column," according to the official project description. Planning and preparing the multi-institution effort has taken years, and for the team heading out on Sally Ride that culminated in a flurry of loading at the Nimitz Marine Facility on Point Loma. 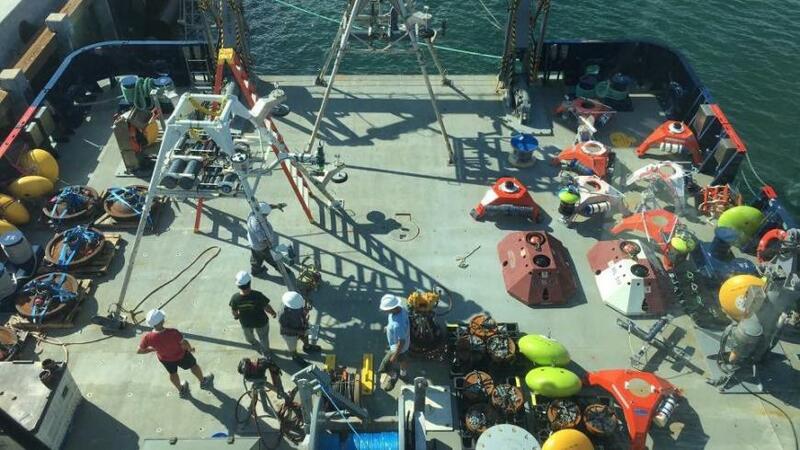 "Readying the ship means loading all of the gear required for 42 moorings which have been programmed to sample the water column from 20m to 50m depths measuring velocity, density, and turbulent mixing," project scientist Amy Waterhouse wrote on the project's official blog. "In addition to deploying moorings, the 18 members of the science party on R/V Sally Ride are setting up underway equipment including an ADCP (acoustic Doppler current profiler, capable of measuring velocity at the very near surface) on an over-the-side pole, a bow chain (string of instruments that hangs off of the bow of the ship away from any contamination due to the ship wake) and an underway profiler at the stern of the ship capable of measuring turbulent mixing as well as density in the water column."